In the beginning, there was a tin can shed. It was a falling-down, rusted, weedy haven for local fauna; a yard shed, hosting its own rooftop garden. The corner location made it easy to overlook, especially given the scope of more pressing house projects. Water in the basement and holes in the walls have a way of grabbing attention. Eventually the shed would have collapsed of its own volition, without anyone’s intervention. It served as a testament to the forces of gravity—things break or fall down–and the 2nd law of thermodynamics— over time, disorder increases. Earth and water were winning the battle to reclaim the shed. Bamboo leaf debris had settled on the roof and decomposed. The compost became a fertile growing medium for volunteer weeds. 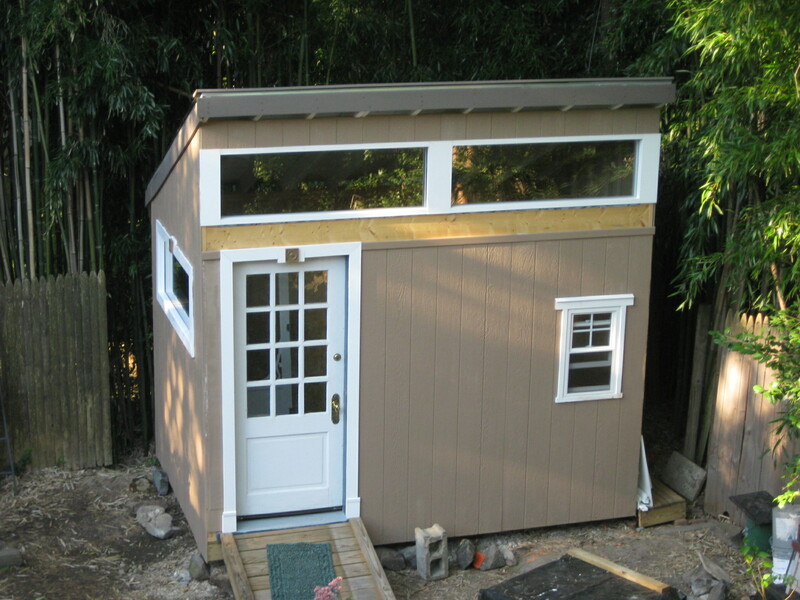 End result: the shed was unsightly, but functional. From the perspective of unobtrusive, it was tops. Rusty brown and mossy green are colors found in nature, so the rust and moss blended into the surrounding vegetation. 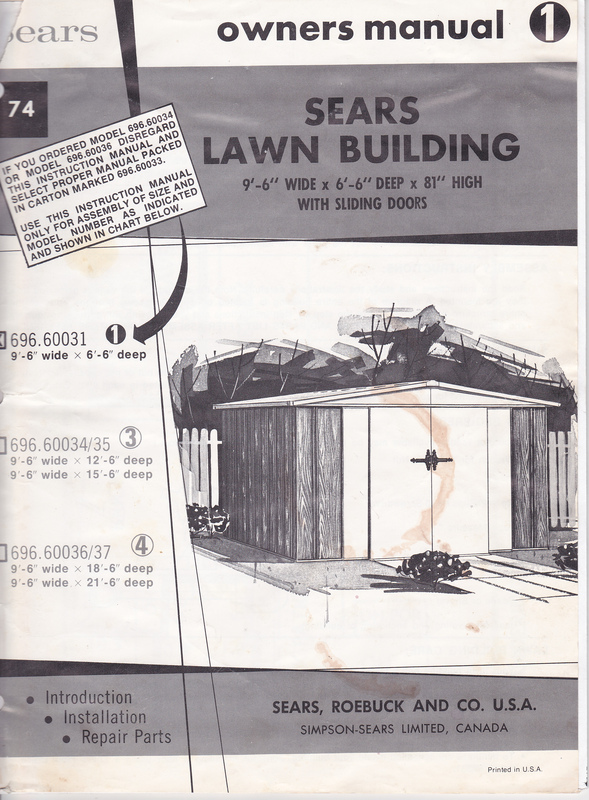 From the assembly manual which has outlasted the building, the shed appears to be Sears vintage 1974. When first constructed, it was stylish; a look that had expired. During a walk-through before house closing, a friend suggested that I ask the owners to remove the eyesore. I didn’t ask. Too many details to juggle with the closing while my husband was enjoying his time in Afghanistan. So, I used the clutterers’ catch-all excuse; It might come in handy someday. Really. And the covered storage space was a helpful catchall for yard paraphernalia and squirrel habitat. From idea to design to usable space was filled with learning: books, articles and videos. Looking at how other sheds were put together… Exploring houses under construction… Asking questions of people who seemed in the know… My problem was even the simplest explanations made assumptions about what I knew. It’s like encountering someone with a different native language. If you speak louder and more slowly using the same words, the meaning still isn’t clear. I had wandered into a foreign land populated by mostly male natives with a specific vocabulary. Their frame of reference couldn’t conceive of those who were clueless about what a birds mouth had to do with a board and not a winged creature or header/footer with a wall and not a document. 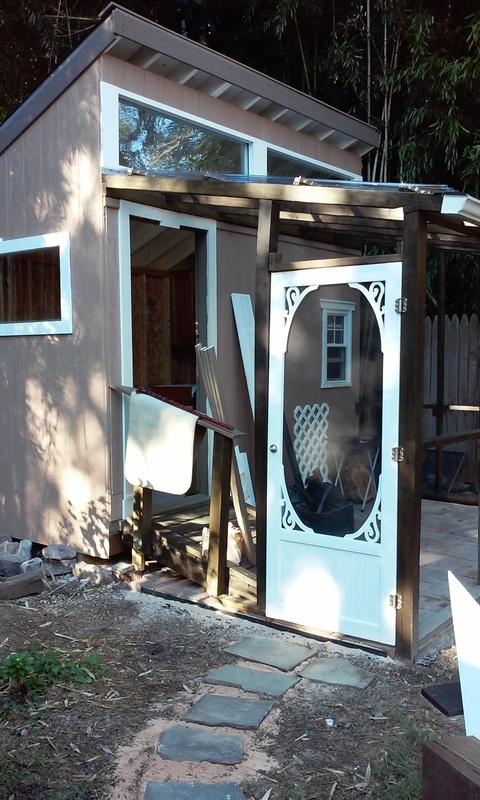 Last fall, we deconstructed the old shed and had the metal hauled away. Over the winter, I sketched designs to incorporate salvaged windows, door, lumber and ramp. There were decisions to make about structure size and materials ordering and delivery. Trees were removed. I researched county codes, foundations, window installation, and load bearing walls. Miss Utility marked lines twice–the first markings in the snow didn’t last through construction delays, caused by builder ignorance. It’s only a shed. 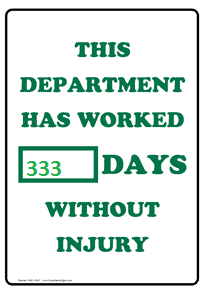 Through the construction process, we used that mantra to remind ourselves that this isn’t a big deal. 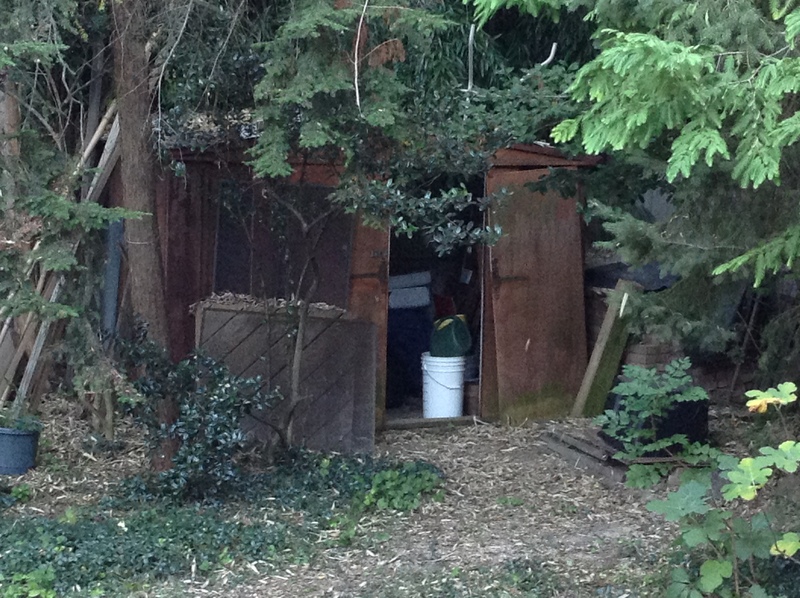 The shed has no plumbing, electric or insulation. Fortunately, we are not planning to live in it. Summer is coming to a close and it’s still a work-in-progress. The skid foundation was placed in May; framing and walls in June; windows in July and roof in August. September has been laying the patio and framing the porch roof, with screening soon, just in time for cold weather. Yesterday, a gutter; today a downspout. The work goes ever on and on. And someday the backyard will not be a construction staging area. Learning has been an adventure: appreciating the value of helpful friends and tools like quick square and chop saw; the importance of correctly spaced wall studs; recognizing the tedium and potential dangers of construction work. And despite blazing hot days, falling and falling lumber, there have been no trips to the ER. It’s time to wrap up construction, donate excess materials, reclaim the yard and start a new project. What stops us? And is there an IndexCardCure™ solution? ← I’m Not Ready To Say Goodbye to Summer!